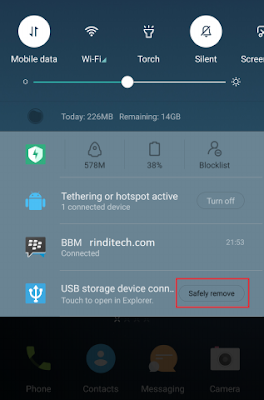 Here is how to eject / remove safely Flashdisk OTG (On the Go) or media that connected to your Android Smartphone. In PC or computer usually appears the words "removed safely" if the flash disk is connected can be removed from the port. Then how to eject the FD with the correct method from the smartphone? The existing technology in the smartphone more diverse, ranging from software to hardware support that sometimes like a bit ‘too much'. The existing technology in a smartphone will be overstated if its users do not take advantage of the technology with maximum, or even worse is many smartphone owner who still do not know what their smartphone can do. One of the new features or technologies that look very functional in the smartphone is the feature to connect with external storage devices such as connecting flash disk directly to HP, it is really help when we need to copy or transfer some files between our external storage to our smartphone, without using computer. Now, just by using OTG USB converter we can connect flashdik with smartphone. In fact there are some type of flash disk that has 2 pieces of port, 1 USB port commonly used to connect to a computer or laptop, and another Micro USB port that can be directly connected to the micro USB port on the smartphone (which is used to charge the battery). Are all Smartphones able to be connected to the flash disk (external storage)? The answer is No. Why? Because it takes the latest technology for a smartphone that can access the data in your flash disk or other storage media. As time goes by we are confident that in the future all new smartphones product will support the OTG feature. If we are looking on the trend, such as accessing data on flashdiksk and even external hard drive, it is possible that all manufacturers will soon equip all their new smartphones with this USB OTG feature. When the first flash disk is connected to the smartphone, usually appears notification of new devices are connected and the notification is also there is a choice to remove / eject flash disk so that if we have pressed the button then the flash disk can be removed with safely, without fear of harming or removing files which is in the flash disk. But sometimes and maybe often, after we access the files or folders in the flash disk via the smartphone, safely remove media (flash disk) in the notification area sometimes gone (disappear). Then how can we unplug the devices safely, without worrying of data loss. Here is the safe method to eject or remove flash OTG that being connected with android phone. In this practice we use Xiaomi smartphone which known have a more stringent security system than other android phones. Make sure there are no activities that access the storage on the flash disk, such as copy, edit the file name, view the photos in the flash disk, etc ..
Klik >Ok. Wait a second to make sure that the system was fully disconnected. Unplug the flashdisk from your phone. Done! 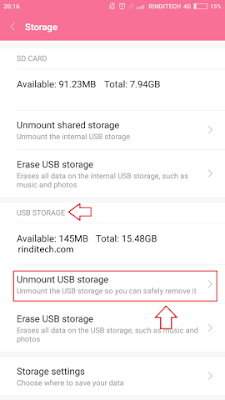 After doing the tutorial above then the data in both media or device is safe to be revoked (unplug) and the data will not be damaged because the process of removing the external storage media (flashdisk) is correct. We are believe that this method is not only for Xiaomi smartphone, for other brands also can try the step by step in this tutorial. It may be slightly different from the writing /menu above but in general they are similar, the setting to do eject or unmounts is on the storage (storage) section. Although this feature is make us very easy to transfer files from external storage, but we do not recommend you to connect the flash disk to your phone too often because we are afraid the ports in smartphones will scratched quickly or become reduced its performance. Do it when needed, or do a lot of file transfers on a one-time connection. If you guys experience problems or error when doing the tutorial or steps above, please put your question or suggestion in the comment field below as usual. 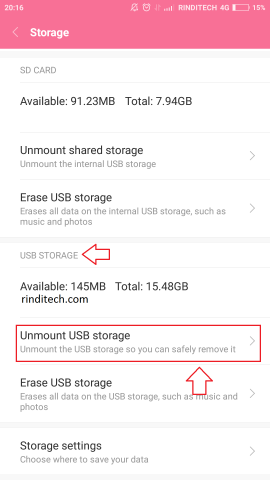 Hopefully this article or tutorial on how to do eject or remove USB flash on Android phone could be a solution and reference for you all. Thanks, keep being a wise user! #beWiseUser!